A few years ago I was driving around during the winter time and I noticed something unusual in the woods not far from my house: an abandoned cemetery. I hopped a fence and was surprised to see that it was a pet cemetery. Recently, I found that the cemetery has been cleaned up and made accessible. The cemetery was founded in the 1930s for pet burials but somewhere shortly after WWII someone thought it would be fitting to put up a memorial to dogs who had served the country. When I first saw the cemetery, the huge monument with the dog on top was almost impossible to reach because of the brush which had grown up around it. A veteran of two campaigns was buried at the base of this huge marker. USMC SGT Sparks served at two of the ugliest battles our forces saw in that war. In the mid-1980s, the cemetery had fallen into disuse and became overgrown which is how I found it in the late 1990s. I heard recently that the cemetery had been cleaned up so I took a detour over for a look the last time I was in that part of town. And I’m glad I did. Volunteers have made the cemetery spotless and they have even begun using it again for services. The Michigan War Dog Memorial is now the official resting place of many of the country’s bravest K-9s and even law enforcement and rescue dogs make this their final resting place. SGT Sparks has been joined by veteran K-9s who saw duty in Iraq, Afghanistan, Kuwait and anywhere else our armed forces have needed them. I got out and walked around. It was a far cry from when I had seen it over ten years ago, all covered with underbrush. And with the additional markers for the war heroes buried here, it was a solemn and moving experience. 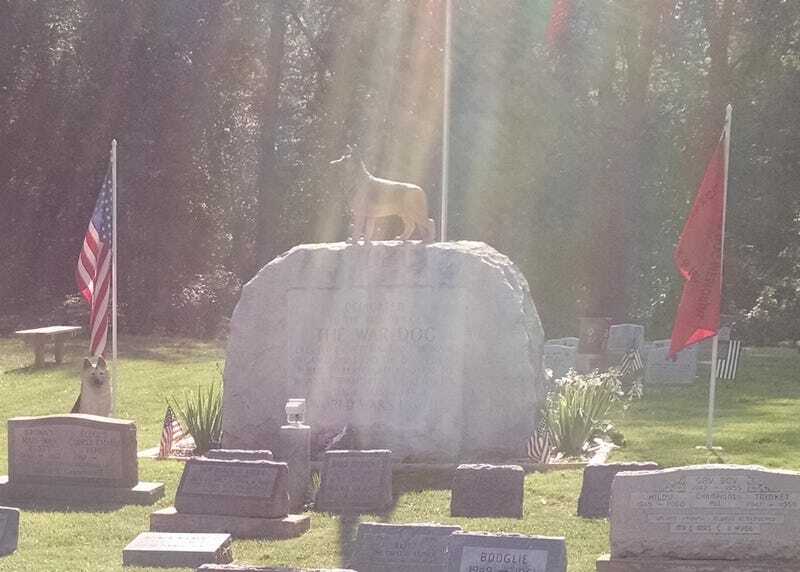 Visit the Michigan War Dogs Memorial website if you love dogs. And if you are ever in the southwest corner of Oakland County, Michigan, visit. It is well worth it.